The fairy tale "Beauty and the Beast" is flawed. I love it, but it’s messed up. The beast is messed up, too, of course: he has to stay a beast unless someone is willing to marry him. But Beauty comes, and she’s gorgeous and sweet and smart and everything good. The beast falls for her kerplunk! What if she were merely ordinary-looking? What if she were nasty or moody or cruel to small animals? What if she were gorgeous and sweet and smart and everything good, but she just didn’t appeal to him? What if she’s eager from the get-go to marry him because he’s rich and has magical servants, even though she doesn’t love him in the slightest? In the story, he never has to face his core problem--What’s it worth to become human again? Is he willing to be stuck in a loveless marriage? Is he willing to sacrifice his self-esteem in exchange for a handsome form? I wanted to tackle this, but I wanted to do it in a new way because there are already two B&B retelling novels that I adore: Beauty by Robin McKinley and Beast by Donna Jo Napoli. So I found a gender-reversed version called “The False Prince and the True,” which I hope you’ll look up, so you can see what I used and what I didn’t. In this tale, the beast is an old lady, and the prince shudders at the mere idea of marrying her. I wasn’t crazy about that. After all, I’m an old lady, and I flatter myself that I’m not that repugnant! 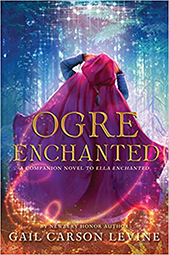 Instead, I turned my heroine, Evie, into a hideous, hungry, angry ogre, who can barely stand herself--but an ogre with self-respect–and the story flowed from there. The book was fun to write and fun to bring in elements and characters from Ella Enchanted. I particularly enjoyed inventing the checkered backstory of Ella’s father, Sir Peter. What a scoundrel!